After last year’s fire that I started while heat gunning the exterior of our 1888 Victorian, I started researching alternative methods of paint removal. 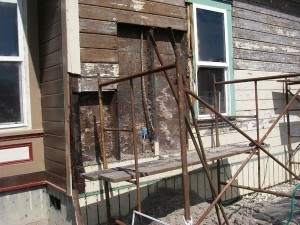 I had previously stripped the entire exterior of our 1914 bungalow in San Jose without incident. But our current house has blown in insulation which presents a definite fire hazard. I looked at several different chemical strippers but they were all expensive, time consuming, and messy. I remembered hearing about the Paint Shaver Pro a few years ago and I had always considered that it must be too good to be true or why would people still be using heat guns or chemicals. Well I started looking for reviews on the Internet and generally they seemed favorable. The biggest stumbling block is the purchase price. The 6 amp model is $599. But considering that the small fire I started with the heat gun cost me more than that to fix, well it was a no-brainer. Especially since I got away very lucky with the fire and caught it early. I tried getting a used one off of Ebay but they always ended up going for close to the new price so I finally just ordered it from their web site. I received it about 10 days later. I just went with the 6 amp model, and none of the accessories. The blades last a long time and several Ebay auctions I saw people were selling lots of extra blades they never ended up using. The biggest difference other than price between the 6 amp and 8 amp models is that they say with the 8 amp model you don’t need to sink any exposed nails. Well I’ve hit a few nails with my 6 amp model and it doesn’t seem to create much of a problem, not even nicking the blades. I used a couple of boards that were going to be removed to practice on. Once I got started I couldn’t believe how fast it really went. 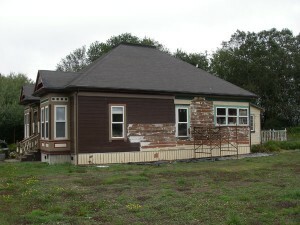 In one day I easily finished stripping the south side of the house. Using the heat gun it would have taken me at least a week or more, plus a lot of electricity. There were a few areas that it couldn’t get into, mostly because of the exhaust vent, but I can sand those small remaining areas. The shaver can leave some circular marks but they sand out easy. It’s a lot easier sanding the redwood without having to go through all the layers of paint. I have v-rustic siding so it still leaves the groove that needs to be stripped. A previous owner caulked all of the joints which was a really stupid thing to do so I’m still spending a lot of time removing the paint and caulking from the v grooves, but it’s still progressing a lot faster than the section I did last year. The fact that I haven’t had to call my fire department out this summer was an extra bonus. It’s embarrassing when you’re a fireman to have to call out your own department to extinguish a fire you started. Can you comment on the vacuum you used with the paint shaver? I’m interested in capacity and how frequently you needed to empty it. I used a regular household type shop vac. I don’t remember how often I had to empty it, but I would guess not very often as it’s vacuuming dust so it packs pretty tightly.